Are you ready for a profitable February? The holidays have been over for awhile and you are probably back in your routine. But is it a money-making, getting-more-customers, my-business-is-exploding routine? If it is, can you teach me? If not, how are you going to stay on target with promoting your hobby business to attract more customers? In January, I gave you suggestions on setting up your social media plan. If you missed it, you can read the post here. One point I made was to focus on your favorite social media venue. But for the month of February, let’s focus on Pinterest. 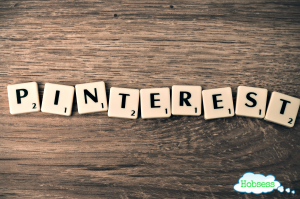 Pinterest is a great tool to bring people to your website or online store or blog. You use images and headlines to attract them. Pinterest users click on the image (pin), go back to your site and if they like what they see, buy your products and services. Most of the visitors that I get here on Hobsess come from Pinterest. But that would obviously have never happened unless I first set up my account as a business. This is different from a personal Pinterest account that you may have now. Follow the steps from Pinterest to make that happen here. 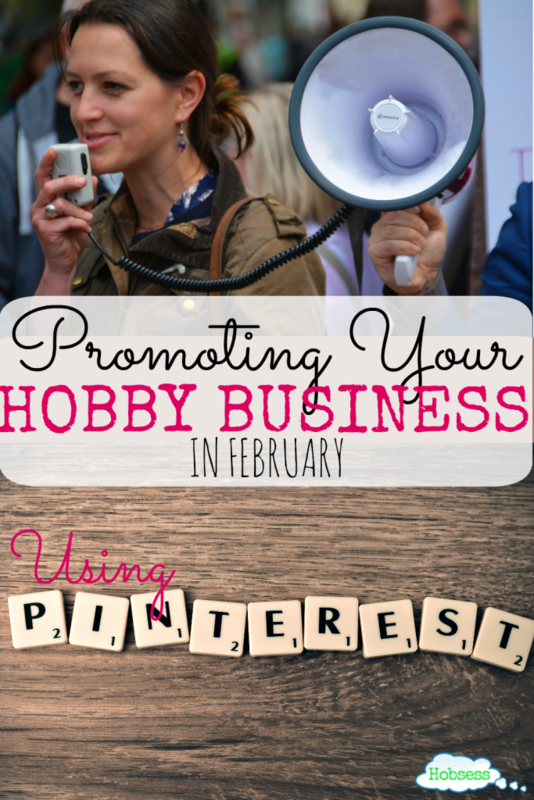 To get the most out of Pinterest is to make sure your pins are “rich” pins. Rich pins let your pins look more professional by automatically including your website and other important information. There are 6 types of Rich Pins: app, movie, recipe, article, product and place. Here is a video to show you how to get that set up on your website. Your pin images can be the difference in making someone click and find out more or just scroll on by. Paying for images can get expensive and you cannot get any picture you want off the Internet. Yes, it is possible to right-click and grab a picture that you want. But the owner of those pics can come after you and they will win. You could end up paying a hefty fine for an innocent mistake. There’s really no need to when you can get them for free. The only downside is that you may see your pictures on blogs, Pinterest, etc. There are a lot of thrifty folks out there. But don’t let that stop you. Make the pictures your own by customizing them. If you can afford to buy pictures that, of course, is a possibility and there are many sites where you can purchase them. This image came from Pixabay. I recommend (and use) free graphics from Pixabay. You can create an account or use without a logon. If you don’t create an account you will have to enter a captcha each time to download images. They also have videos. As a registered user, you can upload your own pictures to be used by others. It’s a really great way to give back and add to the community. Here is a video with an overview of Pixabay. After you have selected your free image, you can customize it using PicMonkey. There is a free and also paid premium account. With the free option, you should be able to adjust the picture how you want. The downside with PicMonkey is that you cannot save an editable version on their site but the benefits far outweigh this inconvenience. Here is a tutorial that could save you some time with PicMonkey. There are a few tricks you can use to set your pins up for success. You will notice on Pinterest that some images are so small, you don’t really notice them. Others are too long and it becomes more annoying than helpful. The best pins are long, tall rectangles with powerful, compelling text. PicMonkey has a preset Pinterest pin of 735 x 1332. You can find it using the drop-down menu under Crop. I use 1000 x 1500. Play around with various sizes to see what you like and then stick to it. Make sure that you have at least one pinnable image on each of the pages/posts on your site. It’s more difficult for anyone to share your website content if there isn’t an picture to pin. When you are ready to save your pin, use keywords to help with your SEO to get your content ranked in searches. For example, instead of naming an image of two ladies planting tomatoes in pots “gardening” name it “learn-container-gardening” instead. Also, include your key words as much as you can in your tags and descriptions. Just make sure the text is varied a little (ex: learning container gardening, etc.). I use Social Warfare for sharing on my site. See the sharing icons on this post? They are from Social Warfare. This WordPress plugin has really been a valuable tool. It is in Social Warfare where I put the description that I want used on Pinterest pins for anyone who wants to pin one of my posts or pages. You can get it here for your site using my Social Warfare affiliate link. Watch this video to see if Social Warfare can work for you. As I mentioned on the January promo post, I use Buffer to preload my pins to go out when I want them to. I can schedule posts for Facebook, Pinterest, Twitter, etc. for the week or month all in one sitting. Buffer allows me to be consistent no matter what my actual schedule looks like. But, you don’t have to use a tool like this, it doesn’t cost anything to post on social media anytime. If you want to put your posts on autopilot and your budget can afford it, I strongly suggest using Buffer. February Topics: What Will You Post? February brings us Groundhog Day, Valentine’s Day, Black History Month and American Heart Health Month among others. Go to the National Day Calendar to match any observances to your products/services for posting. Find a celebration specifically related to your hobby business and link back to your product. Promoting where you will be selling your product if you are going to be at a craft fair, festival, etc. My offer still stands for February. 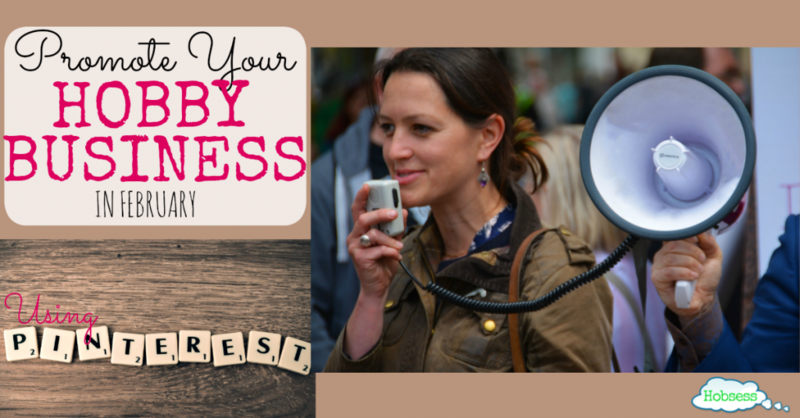 If you are struggling to post about your business, I can help. For less than $1/day I will send out social media posts 5 times/week to promote you and your product/service. Not just on Pinterest but also on Facebook, Twitter and LinkedIn. Don’t forget to follow me on Pinterest. See the sidebar on the right or go here to my Pinterest page and click on the red Follow button.